My father was always an orderly man. His ties were hung neatly on tie racks in his closet, his business affairs neatly filed in folders, his expenses written in neat columns in ledgers. His photographs are labeled, his stamp and coin collections catalogued. 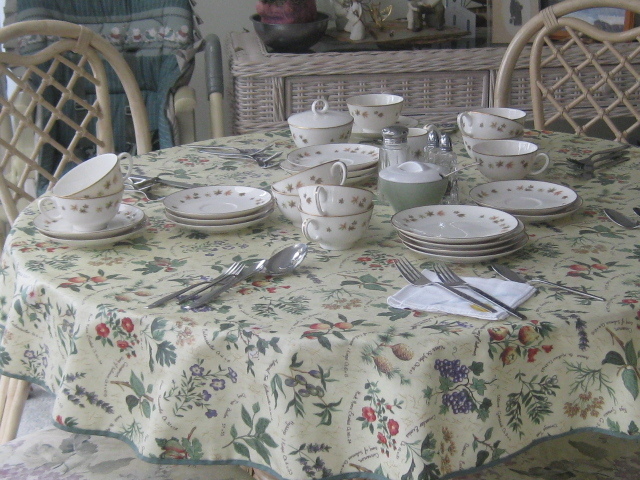 One of the evidences of my mother’s dementia was her setting the table for an army of guests. Non-existent guests. I would get frustrated with it because it meant that I had to put away all the china and silver that she had gotten out. Someone suggested to my sister that we could use the table setting as a bellwether for how she was doing mentally. And I knew that my mother had lost a bit more of herself. My father’s indicator has been the Daily Jumble. For years he zipped through it within minutes of sitting down for breakfast. Then it started taking a little longer. Then one day, he wrote the word TOTATO in the answer space. My sister and I laughed about it because, truthfully, when we had solved the jumble, we had both seen TOTATO before we saw TATTOO. Of late, though, my father usually only solves two or three of the words. Occasionally all four. Sometimes with spelling mistakes. He wrote PICKEL the other day. Sometimes he just gets things mixed up. He sorts through loose change, putting the coins into neat piles, but five quarters in a pile, not four. And he sorts through pictures, throwing away photographs of people he can’t remember. His neat and tidy orderliness has become a sieve through which bits and pieces of his life slip every day. Word jumbles are just a part of it. At least he seems to be taking it calmly when he mixes the words up, not getting upset. So very hard to watch. I think that same one runs in one of our papers. I’ve rarely done those. Occasionally I’ll do a crossword. 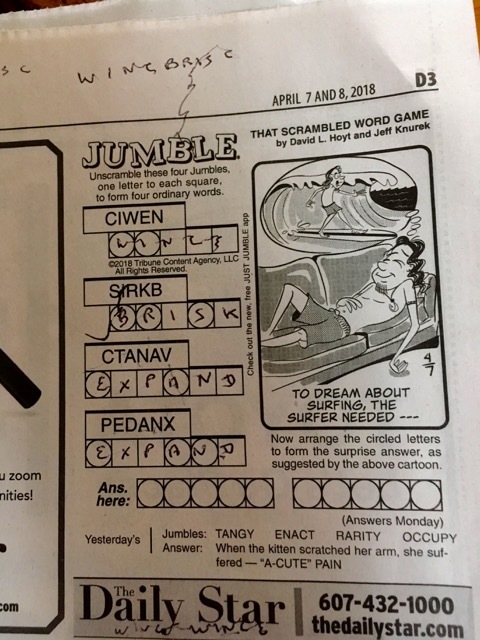 Someone else who has a parents who loves the Jumble puzzle! My mother loved doing them. I still have a book of them, in which she did a few while she was recovering from cancer surgery. I knew she was getting better when she went back and corrected a couple that I did that had errors, haha. And the coin sorting, my father who had dementia was obsessed with that. I remember watching him “sort” a large pile on my parents’ bed.